I took the kids to an antique tractor show at the fairgrounds last month. The air was filled with the spits and sputters and little puffs of smoke from hit-and-miss engines. Crowds gathering and dispersing among the many historical displays. He reached down and pulled up a handful of ears and handed them to Natalie. “Shell ’em,” he directed. 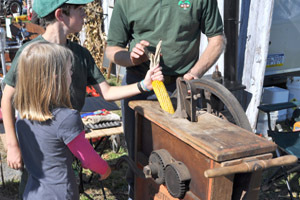 You can imagine they were both smiling by now as Natalie cranked the wheel and Nathaniel added the corn. 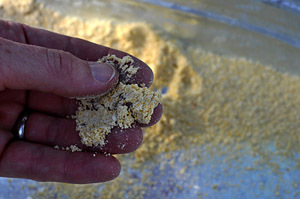 Once the mill chewed the kernels off, they began spilling out the chute. 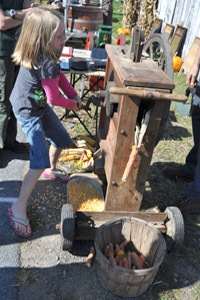 So they gathered the kernels and put them down the mill chute and began to crank. The bowl caught the light, yellow, cracked and milled corn. We thanked him for such an interesting and fun demonstration. Other children had now gathered to give it a go and we slowly made our way to the next display. I glanced back as I remembered shelling corn with my grandfather to give to the wild geese that gathered on his pond every year around this time making their way south. 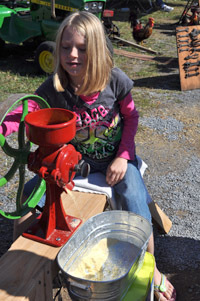 I loved that corn sheller. 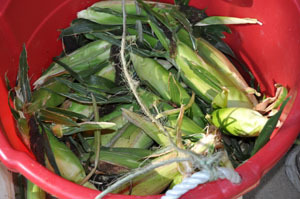 We bade a fond farewell to our sweet corn a week ago. 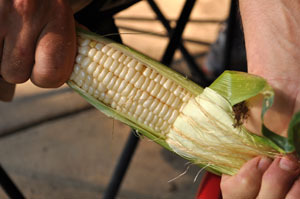 Nothing, and I mean nothing, beats the taste of a freshly picked ear of sweet corn. My husband always plants the old standby “Silver Queen.” It’s been a popular variety with farmers for decades and has a maturity of 92 days. 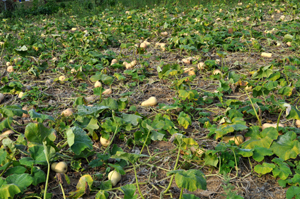 This year, we also planted “Bodacious” which has a 75-day maturity and “Delectable” with an 84-day maturity. 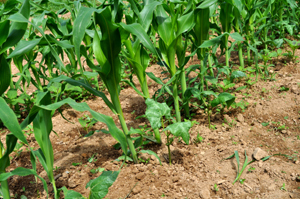 The different days to maturity as well as staggered plantings, allow for a sweet corn harvest over several summer weeks if you’re a savvy planter! 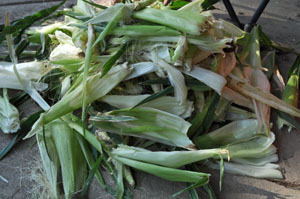 I’ve frozen corn in the past by cutting it from the cob, blanching it, and securing in freezer bags. I’ve even canned it—which is fairly time-consuming because of the processing time in the pressure canner. 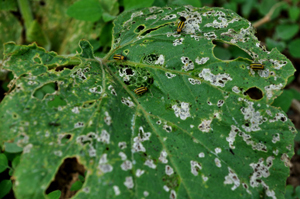 The best way to enjoy it, though, is right out of your garden, right out of the pot, and right off the cob! This very brown pile is responsible for making our corn very happy. The pile in the picture came from one very large stall that wasn’t cleaned along with the others a few months ago—and had over-wintered. David estimated its weight at 4-5 tons! It’s a very difficult job breaking the mass apart in the stalls, separating it into wagon loads and taking it to the compost area away from the barn. And to say the ammonia odor is “strong” is an understatement!! 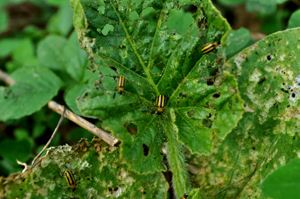 However, the contents are rich in “plant food” and feeds the garden soil that is constantly at work to “feed” and nourish the plants. 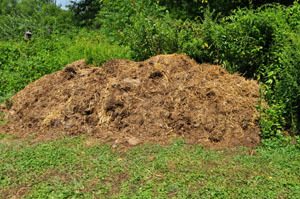 The remants of the pile will compost itself and shrink down. 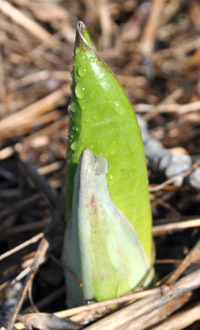 We’ll use it in the Fall or even next Spring. Right now? 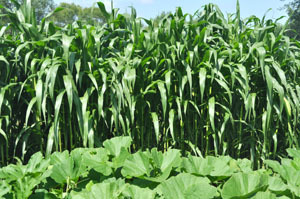 The corn’s pretty happy—if a vegetable can be “happy”.